Interior waterproofing is also known as “negative side” waterproofing; although there is nothing negative about trying to prevent moisture on the inside of your home. The goal of interior waterproofing is to remove moisture from inside the home. Interior waterproofing is often a last defense effort against moisture that’s breached the exterior foundation. One of the nice things about interior waterproofing options is that they are often inexpensive and some are even able to be DIY jobs. While “negative side” refers to interior waterproofing, exterior waterproofing is known as “positive side” waterproofing. With exterior waterproofing, the goal is to stop moisture far before it can reach vulnerable spots of the home. Exterior waterproofing is more expensive than interior waterproofing due to the large amount of work required. Excavation can be necessary, often requiring heavy equipment. However, exterior waterproofing is generally more effective than interior solutions. It prevents water from reaching, and weakening, the foundation of your home. Should You Get Interior or Exterior Waterproofing? If you are still pondering the interior vs exterior waterproofing debate, the best answer in an ideal situation is both! Since interior waterproofing is primarily about controlling water after it’s made it into your home, you aren’t really preventing anything since you aren’t addressing the source, only the symptom. Over time, your home can become more vulnerable if you rely on only interior waterproofing. You may consider the cost of exterior waterproofing to be high, often times much higher than some of the more simple DIY interior waterproofing options. But addressing and controlling water before it can enter your home can prevent you from losing thousands or more in flood damage and lost property. The combination of these two methods provides your home the best protection from moisture – inside and out! 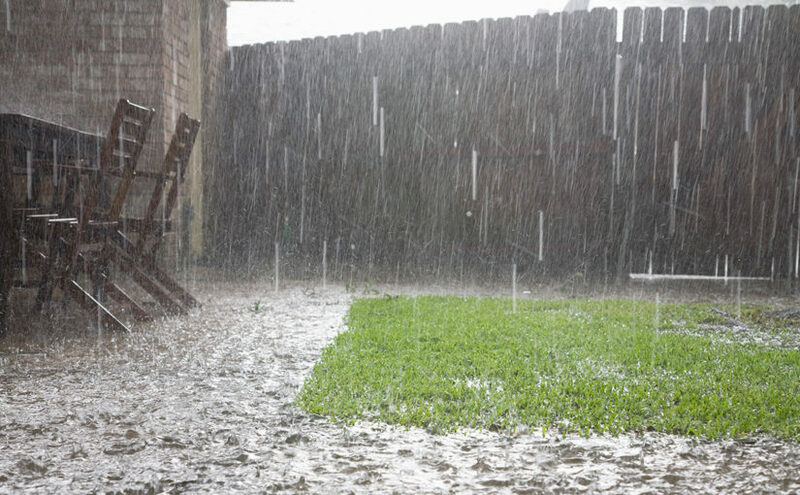 So you may ask yourself, “What risks are involved if I just skip the waterproofing altogether?” Choosing not to address basement waterproofing – interior or exterior – is like rolling the dice and taking the chance on water damage not happening to you. Issues can range from dampness – which invites critters and mold – to flooding issues which can lead to foundation damage and loss of property. Your home is one of the biggest, if not the biggest, investments you will make. Not protecting it properly will end up costing you far more down the road either in damages or in poor resale value. You may think your basement or crawl space isn’t that important to you. However, when you try to sell your home and the home inspector finds signs of flooding, mold, or water damage, you could be required to do the repair and/or waterproofing prior to selling. So, you may kick the can down the road now, but you will eventually have to address it. On the other hand, the return on your waterproofing investment may be as much as 30 percent in the value of your home upon resale. Another good thing to note, waterproofing doesn’t “go out of style” as quickly as other upgrades like a bathroom or kitchen remodel. Waterproofing that was done 20 or 30 years ago isn’t as dated as orange shag carpeting or country blue kitchen stencils. So the waterproofing you do now will still be in style even if you don’t plan to sell your home for a decade or more. Besides the three most obvious factors: location, location, location, there are several things that affect a home’s waterproofing needs. The foundation work that already exists is a major factor. A poorly constructed foundation will be at a greater risk for water damage. Waterproofing efforts that already exist will help prevent water damage. The type and size of building affect the waterproofing needs of your home as well as the grading of the land surrounding your home. You could have the finest sump pump or drain tile system in town, but if your land isn’t graded away from your house properly, water will rush toward your basement and foundation because water always finds the path of least resistance. Keep in mind that your roof, gutter and downspout system also works to keep water away from your home. If any of these systems are compromised you could have water issues as well. Finally, you have to take into consideration the weather patterns and the flood risks in the area. Here in Ohio and Michigan we get plenty of rain in the spring and fall. Add to that the snowfall that accumulates and melts in the spring and that equals a lot of water visiting your property. The naturally occurring streams, rivers and lakes as well as wetlands can have an impact on the waterproofing needs you may have. The best way to know what will be best for your home is to have a professional evaluation. Next Next post: What Is Weeping Tile? Is It Important for My Home?